How Should We Understand the Visions of Aerial Toll Houses? In modern times a teaching has arisen and become popular among Orthodox Christians regarding what is known as the Aerial or Celestial Toll Houses. It is based on numerous references to ecclesiastical fathers and writers from the early days of the Church to the present. It was especially developed after the tenth century in Slavic circles, while hardly ever mentioned in any detail by Greek writers. 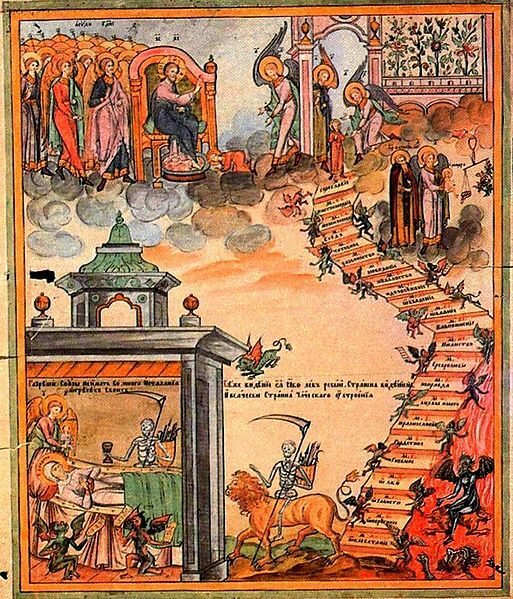 Taken literally, it refers to the idea that upon death the soul of an individual is escorted by angels through the celestial atmosphere, and it goes through a number of tolls or customs where demons accuse the soul of particular sins they committed in life. The escorting angel tries to defend the soul as much as possible, but if a soul is found to be guilty of a particular sin, then with the evidence mounted against the soul the demon takes it and drags it to Hades. This is a foretaste of the Final Judgment, when these condemned souls will be united with their bodies in the general resurrection and cast into the eternal lake of fire with Satan and his demons. 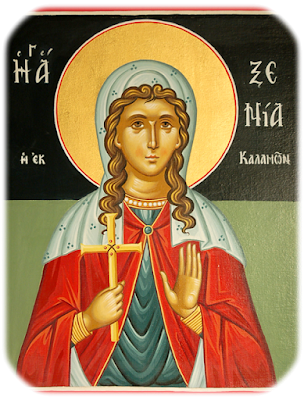 A few weeks ago (in 2009) I received an email asking for further information regarding my post on Saint Xenia the Martyr of Kalamata. The post is here and the question with my answer can be found below in the comments (these have since been turned off). Following my reply this lady was kind enough to respond back giving me background information behind the purpose of her question. I thought it was interesting enough to share in a separate post along with my brief reply for edification purposes. I have been dealing with breast “c” (don’t like using that word)… And a chain of circumstances lead me to believe that it had something to do with healing a previous life… I consulted a friend who is a spiritual light worker who does past life work, and asked her to look at what issue from a past life related to this life… since I had also divorced my husband I was curious to know what relevance it had too… That was not a priority, but if it showed up on anything then so be it. Somehow my ex-husband carries Domentianos energy and I Xenia’s. I will keep you posted, and please should any more information cross your path, please inform me. It will be greatly appreciated. Thanks for letting me know the circumstances relating to your inquiry and I'm sorry to hear about your illness. May the Lord grant you healing according to His will. One thing I wanted to point out to you however concerns the information you received from your friend. I don't know what circumstances led you to believe that your illness had something to do with a previous life, but I can assure you that such thoughts are a temptation to distract you away from the heart of the issue. I assume you are an Orthodox Christian, and if so you need to know that the Church rejects such theories that speak of a pre-existence of the soul and reincarnation. By consulting a New Age psychic or medium you are only doing yourself a disservice and inviting greater harm into your life, which I'm sure is something you don't want on top of everything you are dealing with. Obviously she told you things that seem to fit nicely into a tight package that can be confirmed through a Google search, but for someone trained to spot such hoaxes like I am they are very unimpressive. I'm not necessarily saying she is purposely deceiving you, but I truly believe that there is a demonic element in her advice to you that is in essence very deceptive. From an Orthodox Christian perspective, the New Age uses occultic elements to tap into a world of demonic illusions. By telling you that you were Saint Xenia in a previous life she is feeding you with the greatest harm possible to live a proper spiritual life in Christ. A proper spiritual life in Christ requires humility and love, not the arrogance and hate she is trying to feed you. First, there is no pre-existence of souls and no reincarnation as I said, both of which are doctrines that have been condemned not only in Scripture but in all the writings of the Saints throughout the centuries. I know for a fact that the priest to whom Saint Xenia appeared in New York, Fr. 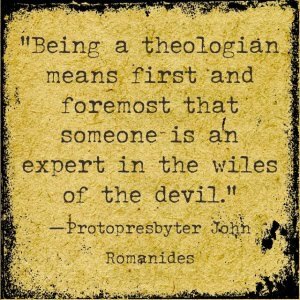 George Nassis, would have rejected this doctrine as well. Secondly, for her to tell you that you were a Saint in a previous life tempted by a ruthless tyrant that supposedly was your current husband is probably the most cruel and ruthless thing I have ever heard. I don't know your husband, but do you seriously believe that in a previous life he was a ruthless murderer of thousands of Christians and that this explains your divorce and your illness? Listen, I'm a divorced man myself, but not even I would believe such things about my ex-wife to justify my divorce. The truth of the matter is that people get divorced for either justifiable or non-justifiable reasons that have everything to do with our decisions in this life. By making you a victim of a previous life, your friend is imprisoning you to a fate that you did not choose, thus eliminating your free-will which is a gift of God to humanity. Obviously demons would rather you were a victim of fate than free-will, but no clear thinking Christian would find this acceptable. Furthermore, people get sick, sometimes for reasons we cannot know. If you choose to be a victim of fate, then I would suggest you do nothing about it and let fate decide what happens to you. If you choose to be liberated and implement your free-will however, then I would advise you to get a more reasonable explanation from your physician. And if you're physician can't help you, then accept it as God's will and seek healing from him through the prayers of Saint Xenia (with the understanding of course that you are not Saint Xenia). I can go on and on about the bad advice you received from your friend that I truly believe with all my heart was inspired by demons. If you don't believe me, then evaluate the fruit of her advice. She is teaching you to believe in phony doctrines (reincarnation and fate), telling you that you were someone you never were (a Saint well known for her miracles to this day that was martyred in the 4th century for Christ), which in turn elevates your arrogance in a subtle way to the point that you were a persecuted victim and above all a Saint, and falsely justifying your divorce (whether it is justified or not) by inciting you towards greater anger and a sense of cruel victimization on the part of your husband. Let alone the fact that she got her facts wrong, since Saint Xenia lived in the 4th century not in the 15th century as you were told and she has nothing to do with Argos which is further north of Kalamata (though she does celebrate her feast on May 3rd with St. Peter of Argos). Furthermore, its easy to advise someone who is divorced and has breast issues to compare them with a person they can Google on the internet that has similar issues (though not the same by any means). Forgive me for being so brutally honest as I know you are desperate for answers. I've dealt with many issues like yours in the past and I see the greater harm such advice brings people and I don't want you to be a victim as well. During trying times we all want and seek answers, but there are some places we don't go for answers, among which are psychics and mediums who will always give you answers that are very deceptive and thus distracting. My advice for you is to go to Kalamata and visit the monastery I wrote to you about. Tell the nuns there your story and see what they have to say about it. Don't leave out the details. And the most important thing for you to do meanwhile is, instead of believing that you carry the energy of Saint Xenia, seek her prayers for you and request God's will for your healing from her. Go to your local Orthodox Church also and seek out a priest to confess your sins to as well and seek his advice. I hope you will consider my advice, as it comes from years of experience and much love. Be well and you are in my prayers. If you have any further questions let me know.